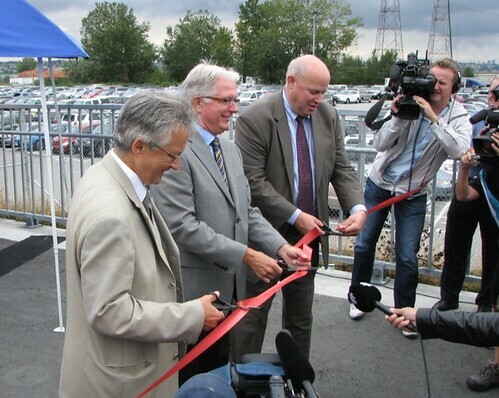 Former TransLink CEO and new NYCTransit President Thomas Prendergast (far right) cuts the ribbon on a new bike bridge in Vancouver. If there was any question Howard Roberts’ resignation yesterday was forced, it can be put to rest, as his replacement atop New York City Transit, the MTA division that runs the subways and buses, was announced today. Thomas Prendergast will be returning to the agency—after a hiatus atop Vancouver’s public transit system—where he used to run the Long Island Railroad, and before that was VP for subways. Though only 57, Prendergast has more than 30 years experience in the field, having begun at the Chicago Transit Authority out of college, then the Federal Transportation Authority, before joining the MTA in 1982. While Gene Russianoff, head of the Straphanger’s Campaign, said authority hopping is the norm, it is worth noting that like his new boss, Jay Walder, also came from a system outside the country, arguably freer from the culture war that at times dogs mass transit in America. “Tom’s work running one of the most technologically sophisticated systems in Vancouver will be invaluable as we take the MTA to the next level in performance and customer service,” Walder said in a release. Good luck, Tom. You’re gonna need it.